Suppose I told you to run a race, but I did not tell you where to run. You could do a lot of running and still not end up at the ultimate goal – the finish line! Now suppose I challenged you to run a race, and at the same time I provided you a detailed map of the race course, a GPS, and a personal guide. The chances that you will end up at the finish line will have increased exponentially! There is nothing like the power of a clear goal to spur one to take action. While a person might be able to make progress with their life without having clear goals, the process of establishing and tracking goals makes their achievement more likely. This is especially true when it comes to money and money management. One rarely stumbles upon wealth. Facts support this. Most wealthy people achieve their success through a series of focused decisions that are inspired by their goals. Your money decisions should be driven by your goals for life! Many people make the mistake of allowing their current financial situation to dictate their goals. 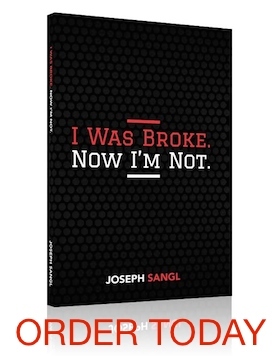 They make “broke thinking” statements such as, “I can’t afford that” or “I’ll never be able to do that.” This is a money lie that can create paralysis in all areas of life. Establish life goals that mirror your plans, hopes, and dreams. Refuse to let the high costs frighten you away from establishing each goal because each one can be fully funded by following this plan. What opportunities do I want to provide to my children? Here’s a “MY LIFE GOALS” form you can use to write your goals.